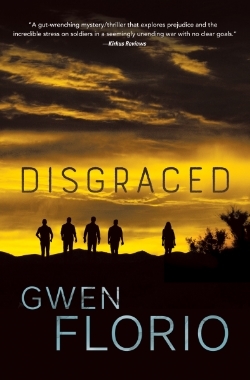 GWEN FLORIO - DISGRACED — Shakespeare & Co.
Thusday, June 9th: Fiction. Gwen Florio reads from her new novel Disgraced. 7pm. As a journalist, Gwen Florio filed stories from active war zones. As an author, she confers that experience on Lola Wicks, the protagonist of a gutsy series set mostly in Montana, where Lola relocated after being downsized from her newspaper job back East. Disgraced finds Lola in Casper, Wyo., picking up Palomino Jones, a soldier returning from Afghanistan. But no sooner does Pal’s military transport land than one of the vets blows his brains out on the tarmac. That night, two other soldiers pick a fight in a bar and put a man in intensive care. And then Pal turns out to have a full-blown case of PTSD. “This would be the part where people questioned the wisdom of a faraway war that took their healthy children and returned them broken,” Lola says. “But this was the rural West, with its staunch and unquestioning patriotism.” In these parts, all the local boys who made it home are “heroes,” and only a cynical reporter would question their sanitized war stories and wonder what really happened over there. Veteran journalist Gwen Florio has covered stories ranging from the shootings at Columbine High School and the Oklahoma City bombing trials, to the glitz of the Miss America pageant to the more practical Miss Navajo contest, whose participants slaughter and cook a sheep. She’s reported from Afghanistan, Iraq and Somalia, as well as Lost Springs, Wyoming (population three). Her journalism has been nominated three times for the Pulitzer Prize and her short fiction for the Pushcart Prize. Her first novel, Montana, won the Pinckley Prize for Debut Crime Fiction and a High Plains Book Award. Disgraced is the third novel in the Lola Wicks series, and two more are scheduled.